Newly released ONGC Recruitment 2019 Notification information is disclosed in this article. All those interested candidates, who are in search for the Central Government Jobs, can find out all the Requirements of the available positions. 86 Assistant Technician, Assistant Grade -III, Junior Technical Assistant, Junior Assistant Technician, Junior Assistant, Junior Fire Supervisor, Junior Motor Vehicle Driver, Junior Fireman Posts are available in the Oil and Natural Gas Corporation (ONGC). Interested Candidates, after checking the complete details can apply for this ONGC Recruitment 2019. Starting from 31st January 2019, candidates, have to submit the application form. 20th February 2019 is the final date. Well, the Oil and Natural Gas Corporation (ONGC) Officials are providing a wonderful chance for all the Job searchers across the Country. The officials are looking for the Candidates, who finished their Diploma, Engineering in relevant Field from any recognized Institute or University in India, as the Educational Qualification. An individual can apply for this ONGC Recruitment 2019, only if they are eligible, and have had all the Qualifications. Otherwise, the contenders can check more other Central Government Jobs, on our site Freshers Now. Now, according to the information in the ONGC Recruitment 2019 Notification, an individual need to complete their Degree or Diploma in the relevant field as the Educational Qualification. According to the regulations of the organization. Apparently, the contenders have to clear the Written Test and Interview as part of the selection process. We shared the total information about the ONGC Recruitment 2019. Hope it is useful for the contenders. Share this with other Job searching contenders. Apply Online For 309 Non Executive Vacancies, after checking the information in the official ONGC Recruitment 2019 Notification. This is a good chance for the people, who are looking for the Central Government Jobs. Use this chance by applying for the ONGC Assam Recruitment 2019, before the final date. Now, 27th January 2019 is the closing date, to submit the application form in the prescribed manner. Starting from 7th January 2019, all the interested can apply for it. If you are interested in checking more other Government Jobs, you can always check our site Freshers Now. Only those applications submitted through the Online Mode will be accepted. Remaining all will be rejected. Here in this section, we are providing a table. And that table covers all the important information such as the Organization Name, Post Name, Number of Posts available, Selection Process, Job Location, Starting Date, Closing Date. Oil and Natural Gas Corporation Ltd (ONGC) officials are expecting the applications from the candidates, who completed their Degree, Diploma or B.Sc from any Recognized Institute. Now, before heading to applying, check remaining information too. Rs.370/- is the application for the General and OBC Category. ONGC Recruitment 2019 Notification is a good chance for the people, who want to settle down in the Central Government Organization. ONGC Recruitment 2018 Notification is released very recently. And through that notification the officials of the Oil and Natural Gas Corporation Ltd (ONGC) are looking forward, to hire the people, who are having all the Qualifications to work as the Specialist Doctors, Hospital Administrator Vacancies. There is a total of 28 Vacancies. So, if you are interested in applying for the ONGC Openings 2018, go ahead and apply for it, by submitting your application form by the closing date. Well, 28th December 2018 is the final date to submit your application form in the prescribed manner. Candidates, have to submit their Applications in an online Manner. The process to submit the application form is given at the end of this article. Here is the chance for the candidates who are searching for Government Jobs across the country. All you have to do is check all the requirements. And then proceed to apply, for it before the closing date. Now, all the candidates should remember well that if they are not having all the qualifications correctly, the officials are going to reject all such applications. Well, for the selected and hired candidates, the officials are giving good incentives and other benefits. So, now if you want to get more details to check the above table we provided. And it covers all the details. Applicants have to complete their MD, MS, and DNB, PG Diploma from any recognized institute or University in India as the educational Qualification from any recognized institute or University. Contenders need to have the age between 34 to 43 years. Our team hopes that the data included about the ONGC Recruitment 2018 is helpful for the contenders. Get more such updated information by following our site Freshersnow.com regularly. ONGC Recruitment 2018: Oil & Natural Gas Corporation Limited is inviting the online applications for the dynamic candidates those who have completed their BE, B.Tech, MCA, ME, M.Tech, BCA, MBA, M.Sc, B.Sc, B.Com, M.Com, MA, BA, Any Graduate and Any Post Graduation. Willing people can apply for the ONGC Jobs 2018 from this post. We are sure that the given Oil & Natural Gas Corporation Limited Jobs Notification help you a lot. In this post, contenders can get a useful information about the ONGC Job Openings 2018. 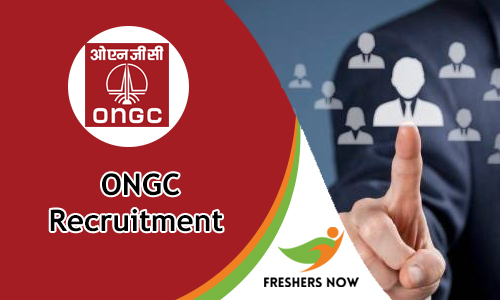 This latest ONGC Jobs 2018 is applicable for both fresher and experienced candidates. Scroll down the current article and check out the education qualification, ONGC Job Openings 2018 list, age limit, selection process, pay scale, application fee and procedure to apply for ONGC Recruitment 2018. Recently, the ONGC Recruitment 2018 is released by the authority of Oil & Natural Gas Corporation Limited to multiple posts. So, we suggest the candidates can check the Oil & Natural Gas Corporation Limited Jobs Notification and apply for it through online mode before the end date. One more advice for the eligible candidates don’t wait until the closing date. To avoid the last minute rush it is better to check the details and apply. Also, the organization of ONGC rejects the late applications and incomplete applications. After completion of the application process, immediately you have to start your preparation. Oil & Natural Gas Corporation Limited Jobs Notification is also known as ONGC. The ONGC is an Indian Multinational oil and gas company. Its headquarters is located in Dehradun, Uttarakhand, India. It is a PSU (Public Sector Undertaking) of the Government of India. It is founded on 14th August 1956. The key people of the ONGC is Shashi Shankar (Chairman & MD). Approximately the count of employees in Oil & Natural Gas Corporation Limited is 33,560. At present, the ONGC holds a 68.94% equity stake. The official web portal of ONGC is www.ongcindia.com. Nowadays most of the people are choosing their career into the Central Government Jobs. So that the ONGC tighten up the selection rounds. We have given the ONGC Syllabus along with ONGC Previous Year Question Papers on our website. Without delay, check the material and start your preparation for the written test. Written Test is the first round of selection process. After that, they need to face an interview round. In the ONGC Recruitment 2018, all the details are available in a clear manner. So no need to worry about the recruitment rounds. Below we have given all the details or you can check it from the Oil & Natural Gas Corporation Limited Jobs 2018 Notification. In this section, we have mentioned the job roles along with the location wise. We have taken the list from the official website of Oil & Natural Gas Corporation Limited that is www.ongcindia.com. So the given job roles is accurate. The minimum age limit for the candidates to apply for the ONGC Recruitment 2018 is 21 Years. And the maximum age limit varies to post by post. The age relaxation is applicable for the candidates as per the central government rules and regulations. As we all know that the age relaxation is set up by the category wise. For SC/ST aspirants the age relaxation is 05 years. The OBC candidates the age relaxation should be 03 years. For PWD candidates the age relaxation is 10 years. We are not sure about the age relaxation details once refer the official advertisement or official website of Oil & Natural Gas Corporation Limited @ www.ongcindia.com. The education qualification for the candidates is BE, B.Tech, MCA, ME, M.Tech, MBA, B.Com, M.Com, MA, BA from any recognized university or institute. Those who have satisfied with the given education qualification then apply for ONGC Recruitment 2018 as soon as possible. All the people those who are interested in applying for ONGC Recruitment 2018 must and should pay the application fee. We all know that there are a different application fee and examination for each post. Coming to the selection process details, the Oil & Natural Gas Corporation Limited is ready to conduct the written exam and interview rounds. First of all, you have to participate in the written exam. For attending the test aspirants need to download their Admit Card. After completion of the written test the authority of ONGC takes some time and announce the results. Those who got minimum qualifying marks in the written test are only eligible for the final round that is an interview. Simply click on the below given link and apply for Oil & Natural Gas Corporation Limited Jobs. Follow our website www.freshersnow.com to check the latest Government Jobs as well as Central Government Jobs. If you have still any doubt related to ONGC Recruitment 2018 then visit the official website of Oil & Natural Gas Corporation Limited that is www.ongcindia.com. Keep in touch with us.